This is an uncommon endemic. This bird looks very similar to the Mangrove Blye Flycatcher. It is lighter blue than the Mangrove Blue and has a blue forehead, eyebrow, and lesser wing coverts. This bird was another "lifer via email". We initially identified this bird as a Mangrove Blue Flycatcher. Later on however, we found out that the Mangrove Blue is not listed in the Kennnedy guide for Coron and Busuanga and that the one we had seen in August was a "noteworthy record". So, it seemed more likely that the bird we saw in November was a Palawan Blue and not a Mangrove Blue. 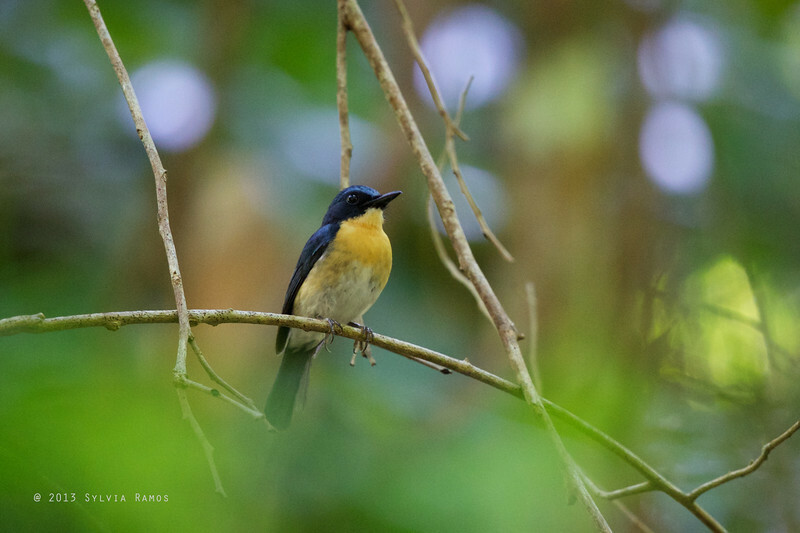 I asked Des Allen to look at the pictures and he indeed confirmed that this bird is a Palawan Blue Flycatcher. Tonji didn't get to see this bird. We were near the dam area when I decided to rest on the big cement blocks by the side on the road. I lay down on one and tried to take a nap. After a while, I woke up because there were a lot of bird sounds. There was one that was particularly loud and melodious, and so I decided to try to look for the bird. I eventually got to see it well, although it kept flitting from branch to branch. Tonji eventually saw and photographed this bird in our other trips to Palawan. Best views so far were in Sabang.